FoodLoop developed an application in the form of a networked software solution for the food retail industry and the consumer. The tool consists of an enterprise resource planning (ERP) extension on the one side, and consumer-based applications on the other. Close-dated foodstuffs with a short remaining shelf-life are in the focus of interest. They shall be marketed beyond the store, and contrary to the usual practice, not end up up in the bin. The food retail stores are now able to sell food products with a short remaining shelf-life as discount offers and to mark them automated in their ERP system. Subsequently, these offers are communicated to the consumer in real time via the FoodLoop App in its personalized profile. By means of this innovation, food waste is reduced in food retail, product and batch management is optimized, and consumers are promptly and individually informed about price offers. How can I imagine the FoodLoop app in practice? 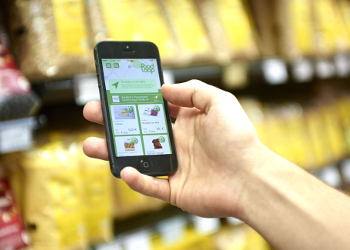 A food retail employee can read in appropriate foodstuffs via the barcode (GS1 DataBarTM or GTIN) with the application on a mobile device, which is coupled with the ERP system, and then provide the system with a discount. The foodstuff is also marked with a FoodLoop-sticker. Information such as type of food and discount amount will be displayed within seconds on the consumer´s smartphone, tablet or PC via free FoodLoopApp. The app provides important food information to the consumer. Additionally, the app allows users to set personal preferences regarding food selection, point of purchase and providers can be adjusted and as well as push notifications. The availability of food is made easily understood by the use of traffic light signals. Once the consumer buys one discounted product , it is automatically entered into the ERP system by POS-scan and the product availability is updated in the app . 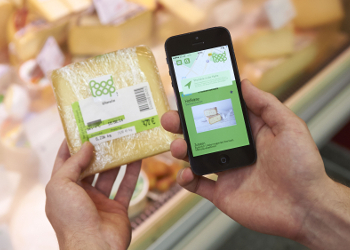 In addition, FoodLoop has introduced the innovative GS1 DataBarTM on fresh and chilled products in the form of mobile printable stickers in cooperation with GS1®. This DataBar provides more information on product features such as best-before-date or use-by date, net weight and packaging. Who benefits from this innovation? In short, a holistic resource-saving solution for the environment, the consumer and the food retail sector in terms of sustainable development and economy. What circumstances brought FoodLoop to develop this idea? As downstream components, the food retail industry and the consumer are at the end of the food supply chain. Foodstuffs require a lot of resources during their production along this chain. Slightly more than a third of all produced foodstuffs are wasted. In high-income countries, the food retail and consumers are wasting most. During his private research Christoph Müller-Dechent found that many foodstuffs in food retail have already been sorted out several days before the expiry of best-before-date or use-by-date and ended up in the dumpster. The reasons were discussed in many conversations with those responsible in food retail: inefficient product and batch management and an internal freshness and quality policy were very frequently mentioned. Wasting natural resources indirectly costs $1.6 trillion US! Many people in the industry concerned, were very unhappy about having to throw away edible food, although sales offers already for foodstuffs with a short remaining shelf-life are already taking place. In a seminar at the University of Cologne, Christoph then developed the first idea of an app for consumers providing realtime discount informations of food retail. In this way the very short-term and limited discounts would be communicated efficiently in a smart manner. The idea to pair the ERP system on a platform with the consumer app was then added. The innovation was born and quickly found many interested parties and supporters! Which goals are FoodLoop pursuing with the app? Pressure on the environment and society is relieved through the efficient utilization of existing resources. A triple-win situation connecting environment, consumers and the actors in food retail in a sustainable und substantial way. Definitely in every supermarket on earth! Ambitious goals create motivation and incentives to make new thought-provoking impulses. We would make a valuable contribution to the resource efficiency with our innovation, minimizing the global impact of food waste and at the same time provide incentives. Abiding by the slogan: do good, save money!